Who can be listed in the online Wholesale Directory? Minnesota Grown Members who market their products to wholesale accounts such as restaurants, grocers, schools and other institutions are invited to participate. Become a Minnesota Grown Member Here. Does it matter how many accounts I service or how big my farm is? No. Wholesale accounts come in all sizes. Some are small accounts that prefer deliveries from farmers through the back door; others are much larger and only work through distributors. The important thing is that you'll have the opportunity to describe your business and products in enough detail so that buyers can identify which farms are appropriate for them to contact. Increased consumer demand for local foods is causing more restaurants, schools, and grocery stores to seek out local farms. In the past, many of these buyers have tried to use the "regular" Minnesota Grown Directory to find suppliers but most farms in the Directory only sell to individual consumers. With more than 1,300 producer members statewide, ongoing staff support to create and maintain databases and a recognized website, the Minnesota Grown Program is the logical organization to offer this service. What information will be included? In addition to basic information like contact and product information, the directory gives you the option of providing additional information unique to wholesale accounts. For example, you can list any third party certifications you have obtained (including GAP certification), the level of liability insurance you carry, and whether you supply distributors, deliver store direct, or both. Buyers will be able to search based on all of these items. The goal is to make it easy for buyers to contact suppliers who meet their criteria and to avoid the frustration that comes from talking to people who aren't a good fit for your business. We've also included several places where you can describe your farm, products, background, etc. in your own words. Once you provide the basic information, we'll invite you to submit photos and logos to make your listing more attractive. A listing in the Minnesota Grown Wholesale directory is currently free for businesses who are already members of Minnesota Grown and intend to sell to wholesale accounts, beyond direct-to-the-customer sales. Membership in Minnesota Grown has two cost levels. All members must pay $20 for the annual logo license. At that time, members can choose to purchase an additional, $40 listing in our Minnesota Grown Direct-to-Consumer Directory (a total of $60). A Wholesale Directory listing is currently free to add to either level of membership and can be done by submitting the form at this link. There are no fees for buyers who use the directory. How do I become listed? You can fill out this form and submit your listing right away. Remember - this directory is only for Minnesota Grown members who sell wholesale or who are seeking to expand the number of wholesale accounts they supply. 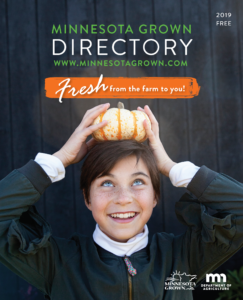 Items marketed directly to consumers can only be listed in the regular Minnesota Grown Directory. Farm to School connects schools with locally grown food. It emphasizes food raised by family farmers for the mutual benefit of our youth, farmers, and communities. It builds partnerships, coordinates trainings, and provides hands-on nutrition education to children. Local food procurement creates opportunities for Minnesota farmers and strengthens the Minnesota economy. Farm to School can look different at each school, but generally fits into three categories: Education, Procurement, and School Gardens. Learn more on the University of Minnesota Farm to School page.